Their attention to detail and quality is evidenced by their local honey which is used as a food ingredient as well in their premium libations (Louie’s Honey & Ginger Moonshine.) While doing the renovation a large hive of honey bees was discovered in the rafters. They were carefully relocated to proper hive boxes on the roof. The bees now live there peacefully and pay their rent in pure honey. It’s now a high-energy Italian inspired restaurant under the culinary direction of partner Michael Fiorelli (ex- mar’sel at the Terranea Resort.) He blends accessibility and innovation with a menu that celebrates the soul of Italian cuisine reflected through a distinctly Southern California personality. Guy Gabriele (the larger-than-life executive chef and co-owner of the former Café Pierre) created the eclectic wine list. There are two chef counters in Love & Salt. One looks into the pizza prep station and the other view is right into the main kitchen with the highly visible wood-burning oven as the highlight. There is also an long community table running down the length of the space. Co-owner Sylvie Gabriele (Farm Stand) is our guest. She is a 2nd generation South Bay restaurateur and Guy Gabriele’s daughter. The guest seating at Love & Salt has possibilities for all tastes and preferences. If old-style comfort is you choice then there are booths along the West wall. For foodies there are two different chef counters where the guest becomes part of the action in the kitchen. For a more lively experience the long bar offers the full menu and there is a lengthy communal table in the middle of the space running from the entrance area back to the kitchen. Menu highlights at Love & Salt encompass unusual items including a Roasted Glazed Pig Head served with maple, vinegar, pale ale, condiments and toast. Earlier in the month the food world lost Chef Charlie Trotter who was the first superstar celebrity chef in Chicago and influenced and mentored a network of prominent young chefs who now have their own high profile restaurants in Chicago and other key cities. Charlie Trotter’s (the restaurant) on W. Armitage was known to foodies around the world for his innovative tasting menus and brilliant wine cellar. Three luscious tasting menus were available at Charlie Trotter’s. They changed each night. The choices were Vegetables, the Grand Tasting Menu and The Super Grand Tasting Menu showcasing 14 to 20 courses. It wasn’t just a meal…It was an experience. Charlie’s goal (and it was sincere) was to exceed the diners’ expectations in every possible way! 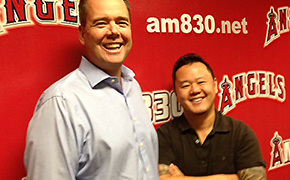 Executive Chef David LeFevre (ex-Water Grill) of the acclaimed Manhattan Beach Post and Fishing with Dynamite joined us. In a blind taste test Chef David explained how he could distinguish an East Coast oyster from a West Coast oyster. There are some different characteristics. He also shared some of his favorite types of oysters. Everyone shared their 4th Of July celebrations. Jet hosed an intimate backyard cookout. He has an incredible built-in brick grilling unit in his backyard that’s great for picnic entertaining. Sherry did some bike riding with her husband along the bike path in Manhattan Beach. She also savored the beach view of all the fireworks festivities along the South Bay. Producer Andy enjoyed the annual Community Celebration and Fireworks Spectacular in El Segundo (Mayberry by the Sea) in Recreation Park. It was a full day of festivities including a pie eating contest and a watermelon eating contest. All the food booths were operated by El Segundo Community and school groups. The grilled hot dogs and hamburgers available before the fireworks show were prepared by the El Segundo Community & School Groups. What’s a 4th of July without grilled hot dogs? Congrats to fellow Californian, Joey “Jaws” Chestnut, winner for the 7th consecutive year of the Nathan’s Famous Coney Island Hot Dog Challenge. He set a new World Record of 69 hot dogs and buns consumed in 10 minutes!